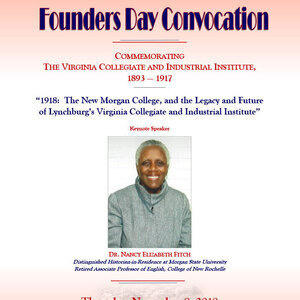 “1918: The New Morgan College, and the Legacy and Future of Lynchburg’s Virginia Collegiate and Industrial Institute"
Faculty must attend in academic regalia. All freshmen and sophomores are required to attend this convocation. Faculty members are encouraged to require their students to attend this important lecture on the history of Morgan State University and to give them assignments associated with this convocation.